Busily Pillaging: BP Vikings exhibition – BP or not BP? 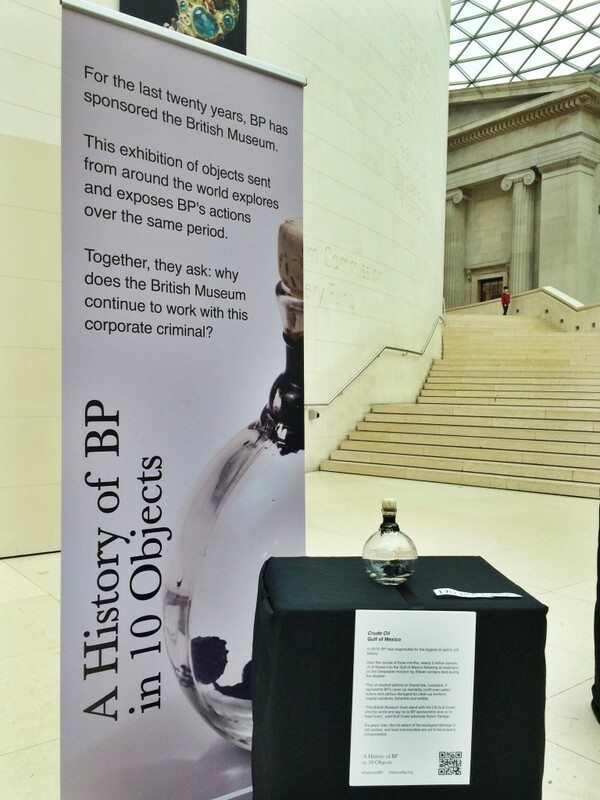 BP is sponsoring the Vikings exhibition at the British Museum. That’s right – those remorseless plunderers of wealth and resources are funding an exhibition about the Vikings. Sign the petition to the British Museum. British Petroleum: the wolf that will eat the sun? The Vikings believed that Ragnarok, the end of the world, would see a rising of the oceans and a great burning of the earth. BP’s business plan relies on such a future. BP admits that continuing to extract and burn oil will lead to disastrous climate change, but according to its own annual report it is hoping to keep on digging up and selling the stuff until we’ve passed the point of no return. Oil companies like BP are lobbying against environmental laws and blocking clean energy alternatives all over the world, to allow them to keep on looting and pillaging the Earth’s natural resources. Experts tell us that with renewable energy we could power the world without fossil fuels – but that would mean less profit for the likes of BP. BP isn’t afraid to get its hands dirty. It’s been accused of trampling over Indigenous rights in Canada, failing to properly compensate the victims of its huge Gulf Coast oil spill and colluding with oppressive regimes from Indonesia to Colombia. Despite the Deepwater Horizon tragedy it is pushing to drill in ever-more risky and polluting places, from deep offshore rigs to tar sands to the Arctic. It’s deeply ironic that this modern-day plunderer is sponsoring the Vikings exhibition at the British Museum – and it’s shameful that the Museum is letting BP get away with it. By providing a tiny percentage (less than 1%) of the annual income of institutions like the British Museum, BP gets a huge amount of positive publicity in return, helping it to present itself as a responsible member of society rather than the oily berserker it really is. Help remove the taint of destruction from our national treasures – tell the British Museum to end its sponsorship deal with BP! We are not saying let us go back to the past – indeed oil should be a matter of the past! We are saying let us move to the future, and that is renewables, solar, wind, etc. We are saying let’s achieve progress in balance with nature and all creatures on earth. YOUR ONLY EXCUSE TO STUBBORNLY FREEZE THE FUTURE IS GREED. BP – money without conscience!! !